I never aimed to join a Milo Marathon event. I know it seems odd but I guess I didn’t imagine myself to be at par with the kind of performer Milo expects from their participants. I guess I still consider myself mediocre when it comes to running which for me, is not too bad. However, I found out the a bunch of my running friends signed up to join either the full or the half marathon and I wanted to be there for them. 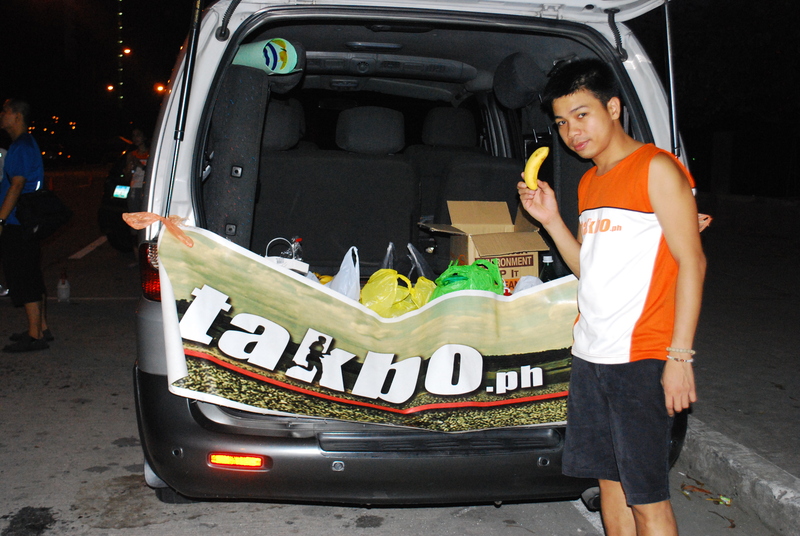 Upon the invitation of Carina, I quickly signed up to be part of the Takbo.ph aid station. It will be the first time for me to man a non-moving aid station and I was excited to help my fellow runners. The cutoff for the Milo Pikermi was 2 hours and 30 mins, my personal best, and I felt that it was a challenging time to beat. For the full mary, it was 6 hours. Whew, tough but achievable. McCoy was our aid station lead and I was his driver. 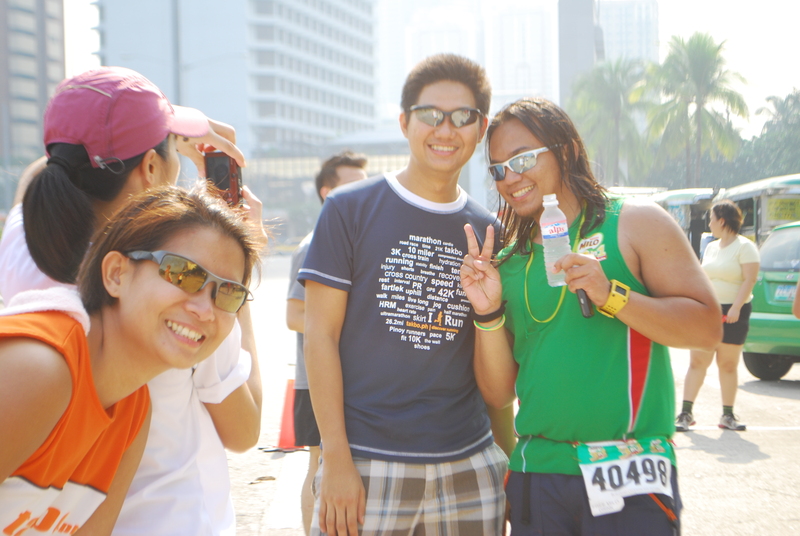 I picked McCoy up at around 3:05am, we made our way to Roxas Blvd to meet up with Be a who dropped off hubby Mark, running his nth 42k. The route of this year’s Milo MM elims consisted of 3 loops around the CCP complex + hill repeats through (Buendia & EDSA Flyovers) made it a very challenging course. With this probably in mind, Carins requested us to position ourselves by the somewhere in this loop. This way to can provide 3x the support to our running community. 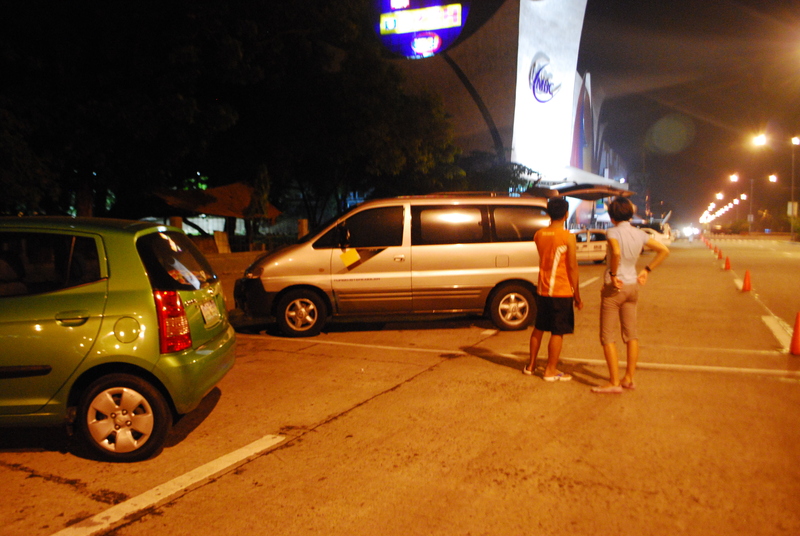 We chose the area near Aliw Theater. Little by little, willing volunteers arrived, eager to help in any way they can. We felt we were ready. Pocari check, Energy gels check, Water check, Ice check, peeled boiled eggs check, bananas (fresh and boiled) check, liniment check, water spray check, camera check, voice boxes for cheering check. We were one ready support crew. I volunteered to take photos of runners passing by. 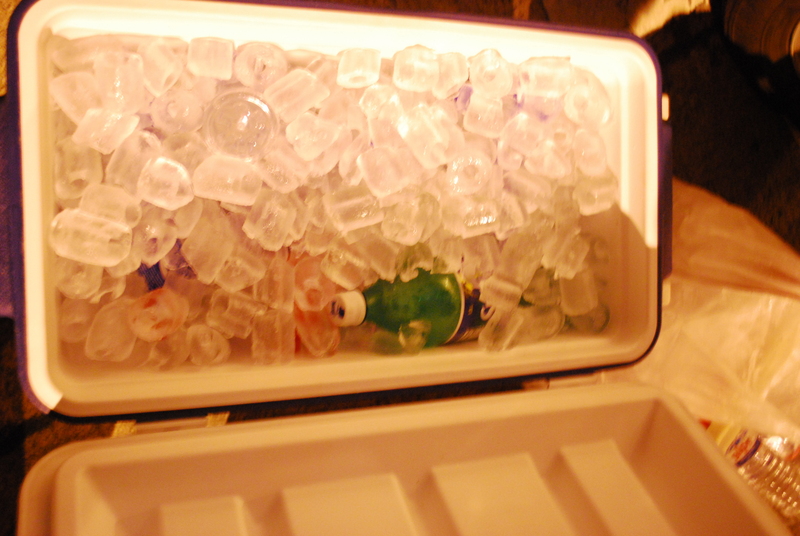 It was one humid and hot day. I remember thanking myself for not signing up last minute. I wouldn’t have survived the heat. The air was thick with humidity. I was sweating like a horse even while seating down. I was suddenly very worried about the runners. I hope they have enough water, I though to myself. 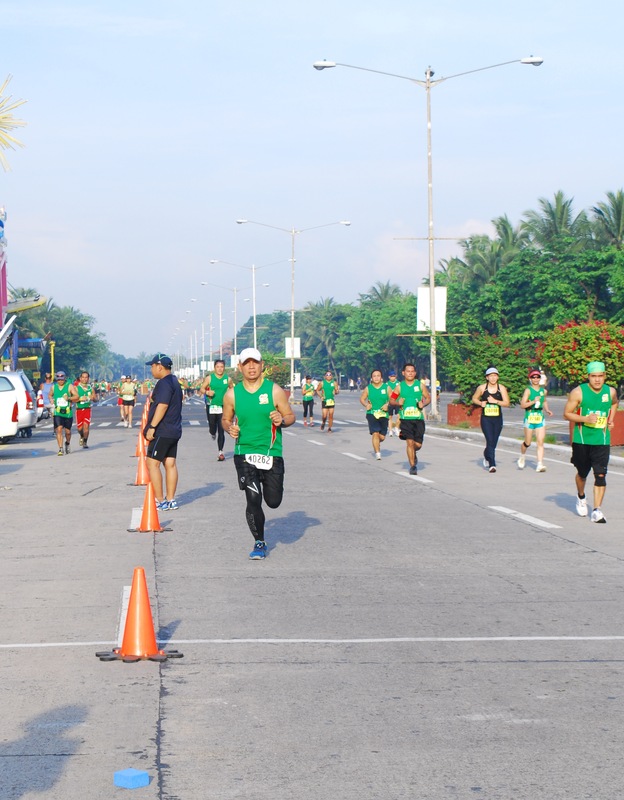 The first wave of 42k runners passed by our station. All were in good spirits and no one needed our help yet. I clicked away. We were all in high spirits. The only downside was this mean middle-aged man who wore an organizer badge scolding us for supposedly “blocking” the path of the runners which is complete nonsense. Oh well. The second round was different. 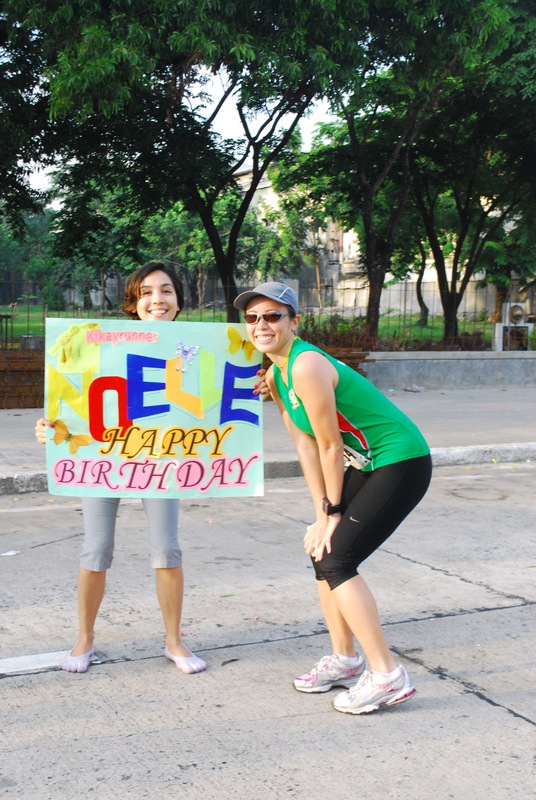 I saw people starting to walk, runners limping but the air of excitement was still there. We would cheer runners as they pass. The elder ones were very appreciative. They cracked jokes with us and thank us profusely. We would here praises such as “nakakataba ng puso”; “nakakagaan ng pagtakbo” and comments like “wala bang picture dyan”; “ok talaga Takbo.ph support”. McCoy took charge of the liniments, other volunteers handled the water & Pocari, I gave out eggs or bananas while taking photos and Irene & others handled the water spray. Suddenly, a few meters from our aid station, a runner collapsed. Rod, one of the 42k runners from Team Boring, hurried to look for an ambulance or a medic. Fortunately, medics quickly rushed to the runner’s aid. We waited a few minutes and the ambulance was there. I said a short prayer for the runner and hope that no one else collapsed. The heat was starting to become unbearable. Why did they choose to start the 21k race at 530am was beyond me. 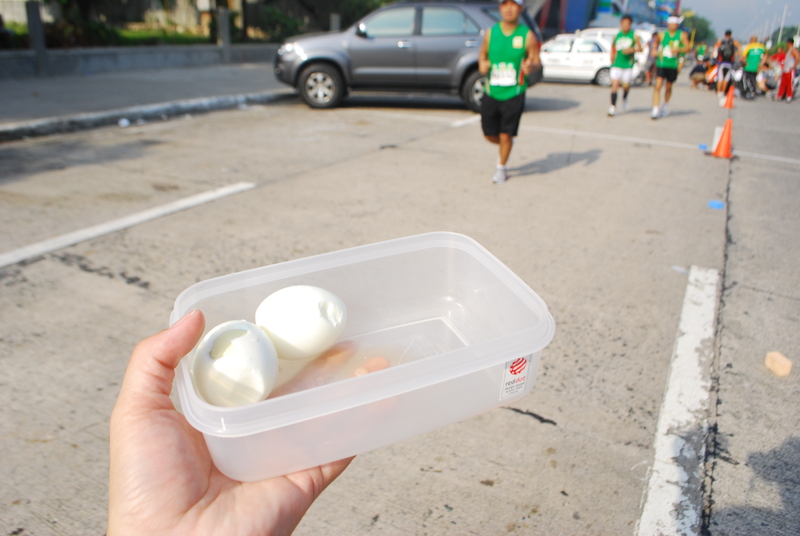 We finished our supply just as the last 3 runners passed by our station. We were worried about Jet and a few of our runner friends as we heard from finishers that there was no water available anymore beyond 4kms. McCoy and Cindy then decided to get some supplies from the convenience store and take these to the Jet and Doc Roy while the rest of us drove off the the finish line to await the finishers. As I was seated in the van enjoying the air-conditioning, I can’t help but think about the runner who collapsed and the lack of water on the last 4km stretch to the finish line. When will race organizers learn that the value of life is higher than valuing the aesthetic outcome of the race? It seems that they spent more money creating a great looking starting/finish line, a huge stage, great advertisement, marching bands etc but they forgot to assure the runners of ample water supply, a lifeline of a marathoner. I fervently hoped and prayed that no one got fatally injured during the event. As soon as I saw Jet safely having finished the race, I headed home. 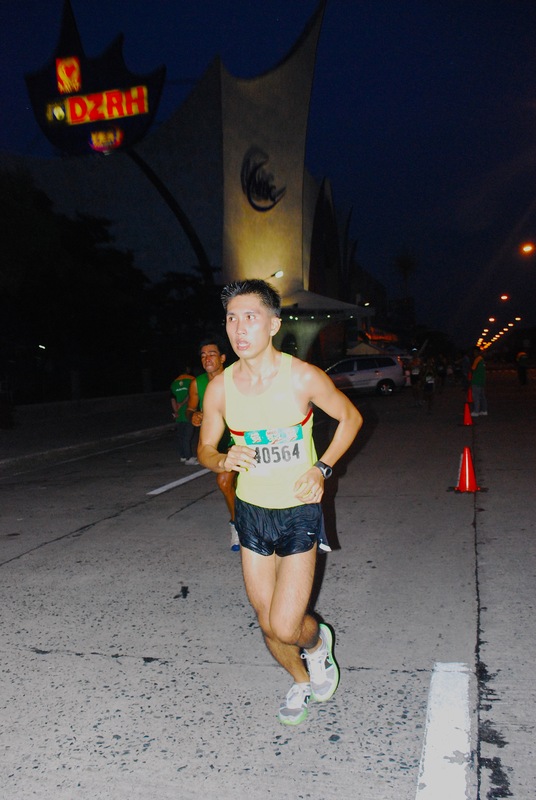 As I write this blog, two weeks after the Milo Marathon, I am struck with sadness knowing that a runner in the person of Remus Fuentes, an IT Professional but more importantly, a father to 2 children, a husband and a son. Hubby, who studied in Lourdes School of Mandaluyong, told me that Remus was a batch lower than him. He ran the 21k Pikermi during the Milo Marathon Elims and he died of heatstroke and dehydration. My deepest condolences to his family and friends. This incident made me realize that one can never be too cautious, never be too prepared. Dehydration is something that can be prevented. Take steps towards protecting yourself from this probably fatal condition. 1. Bring your own hydration. I always bring my own hydration, even if it’s just a short 10k run. It’s better to not need something that’s there rather than needing something that isn’t there. 2. Make sure you train well. Long distance running is no joke. You are exposing your body to a tremendous amount of stress. Make sure that you train yourself well before joining a competitive race. 3. Have yourself checked before engaging in any sport. Thank goodness my sister is a doctor. I got this one covered almost immediately before I started running. As mentioned above, you are exposing your body to tremendous stress, your heart is exerting more effort than usual, your lungs have to sustain labored breathing and your brain is engaged almost 100% of the time. Is your body ready for this? 4. Ensure your body has proper nutrition. Long distance running requires you to tap into emergency energy sources to avoid the pitfalls of dehydration and it provides an instant source of carbohydrates to fuel the energy needed for the event. During the run, if you feel dizzy or faint, stop and immediately ask for help. Don’t let pride get in the way of your own safety. I’m sure that the race organizers did not neglect their duties to keep runners safe. However, I have heard too many horror stories of water stations running out of water that I can’t brush this incident aside. For other tips on running races safely, check out The Bull Runners blog http://thebullrunner.com/2010/07/07/tips-on-running-races-safely-from-the-experts/. You may want to read what Remus’ father wrote about his son http://www.pinoyfitness.com/2010/07/remus-story-as-told-by-his-father/. I hope we all learn from this tragic event. Run well, run safe. Of course the race organizers were negligent. Thats why they make us sign those waivers. In a way, they were negligent allowing water to go dry on the last 3km. However, accidents do happen and this was in my opinion an accident. As I mentioned in my blog, we shouldn’t leave our safety to chance. We should always come prepared. Personally, I would bring my own hydration. It’s my safety blanket. you’re welcome 🙂 did you run during the Milo elims?